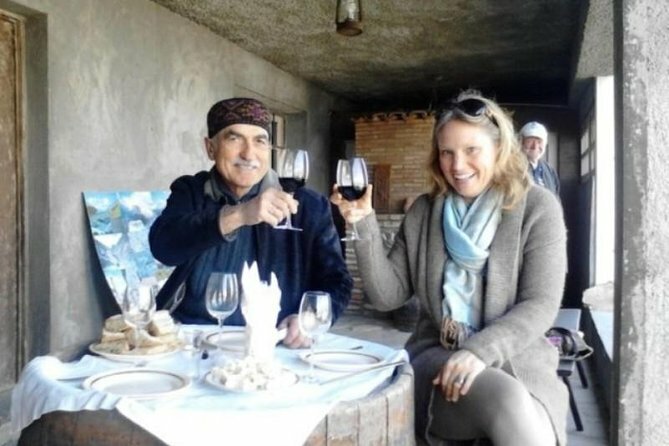 Enjoy a wine-tasting tour to Kakheti on this 8 to 9-hour tour. Discover medieval Gremi Fortress, Kvareli Wine Tunnels, and more. Visit "Shumi" Wine Factory-museum, Prince Aleksandre Chavchavadze's Palace at Tsinandali with its beautiful french garden and Telavi the main city and administrative center of Kakheti area. In the morning, drive to Telavi, Kakheti region - east from Tbilisi, the largest wine producing region in Georgia. The first destination is Gremi Fortress (XVI c) that was the main city of Kakheti region until XVI C. Enjoy the picturesque location of the fortress with tall bell tower and high walls. Next, trip continues to wine tunnels built under the hills of the Great Caucasus mountains. Total length of the tunnels is 8,000 kilometers. Two main tunnels are more than 800 meters each. The tunnels are used to keep the wine. Above the wine tunnels, one can find a beautiful restaurant built on the top of the hill with picturesque views on Alazani Valley and delicious Georgian meals. Further on, head towards Prince Chavchavadze Palace (XIX c) at village Tsinandali with a wonderful French park and wine cellar. After visiting the palace, guests will visit the Shumi wine factory-museum for another wine tasting and if desired, you can purchase some bottles of wine locally from the factory. At the end of the tour visit of Telavi - the main city and administrative center of Kakheti region (100 kilometers east from Tbilisi). Here you can find the local market in the town, where you can enjoy and buy a wide range of different fruits and vegetables, including apples, peaches, grapes, pomegranates, tomatoes, and cucumbers. Finally, travel through Gombori Pass to return to Tbilisi.